Away Luggage: The Carry-on. The Medium. Suitcase Contents: Shiseido Makeup Wipes. Face Primer. Perfect Color-Change Lipstick. Volumizing Lip Serum. Naked 2 Palette. Chanel Perfume. T3 Hair Dryer. T3 Curling Iron (1.5″ Attached). “The Distant Hours”. Shinola Watch. Rose Gold Strap. iPhone X. Chloé Drew Bag. Moncler Vest. Cozy Zip-Up. Favorite Jeans. Suede Loafers (Similar Color). Chloé Flats. I remember the first “nice” suitcase I bought myself. I was studying at FIT in New York for the summer and Bloomingdale’s was having a luggage sale. I decided it was time to upgrade from my leopard print T.J. Maxx bag when I saw a large, black fabric Samsonite I liked and I excitedly rolled it up to the counter. But after a few trips with my new bag, I realized how annoying and dysfunctional it actually was. The woman at the United check-in desk peered over the counter and said, “That bag is overweight; you’ll have to take something out.” I opened up my suitcase, which was nearly empty, and removed my small toiletry kit. I could see by the look of shock on her face she expected the suitcase to be stuffed full. But even without my toiletry bag, it was still overweight. A sweater and pair of boots later, my carry-on now held more than my suitcase and the suitcase was still overweight. 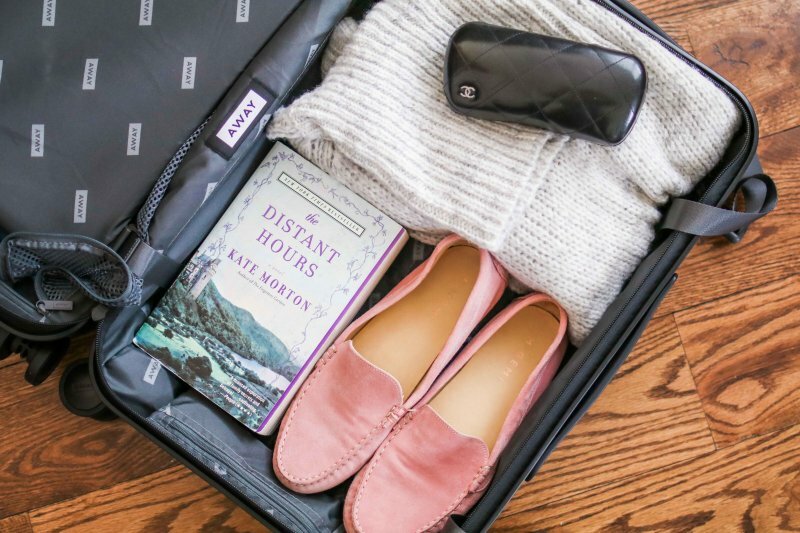 Years later, I “gifted” this problem suitcase to my husband and even he, with his minimalist packing tendencies, complains about how heavy it is. And that’s just one of the many awful suitcases I’ve splurged on and regretted later. I’ve quickly learned that more expensive does not equal more durable or more functional when it comes to luggage. 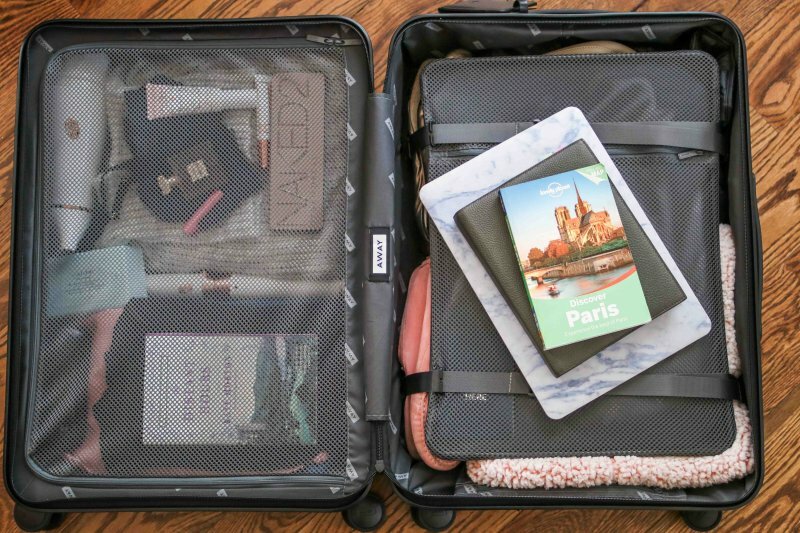 This year, one of our resolutions is to travel more. We don’t yet have children and we have a laundry list of destinations we’d like to see. So for our anniversary, I gifted my husband (and myself, technically… aren’t those the best gifts?!) a set of Away suitcases. I have had several luggage companies reach out to me, but after so many misses in the past I wanted to do my research and choose my own bag, free of posting guidelines and sponsored content in case I was disappointed. So this review is completely unbiased. 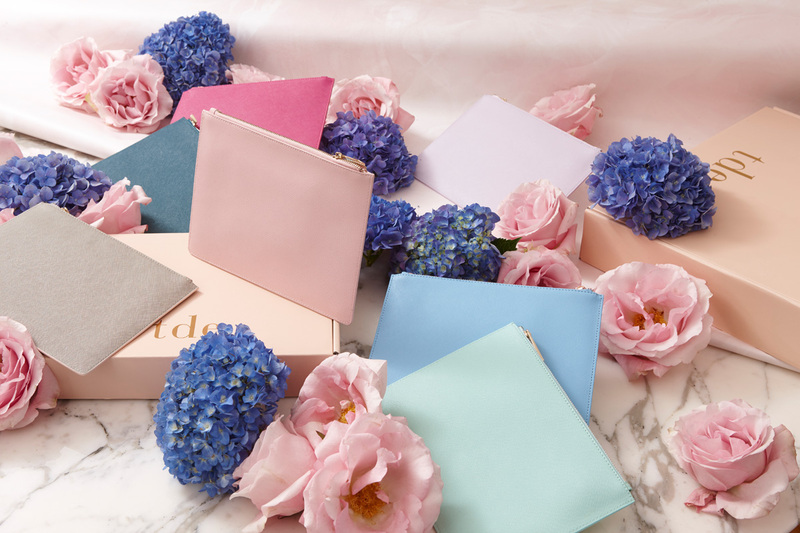 I read stellar reviews on these bags, I’ve tried them out, and I loved them so much I had to share them with you. 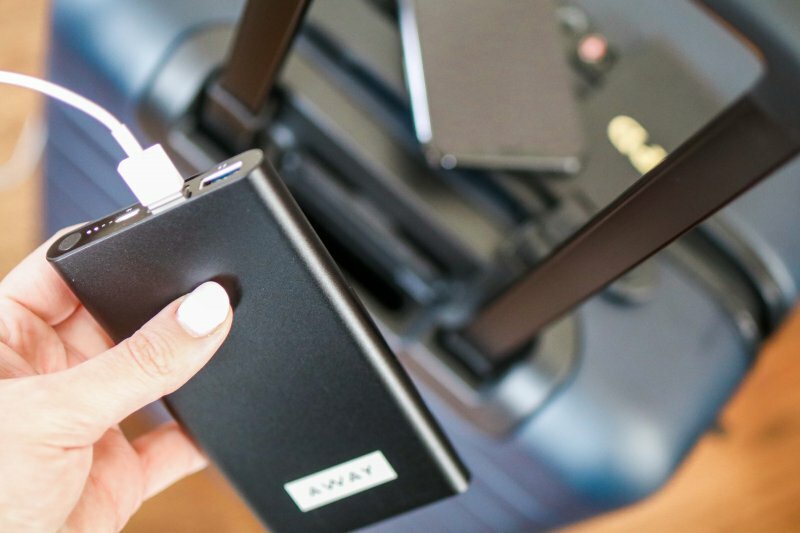 Like most people, I was initially drawn to the Away carry-on because of the handy charging feature; a little pop-out charging battery that allows you to charge two devices while on the go. I’m always on my phone capturing photos and memories when we’re traveling and the ability to charge up during a layover or while waiting for a hotel room has proven to be a useful feature. 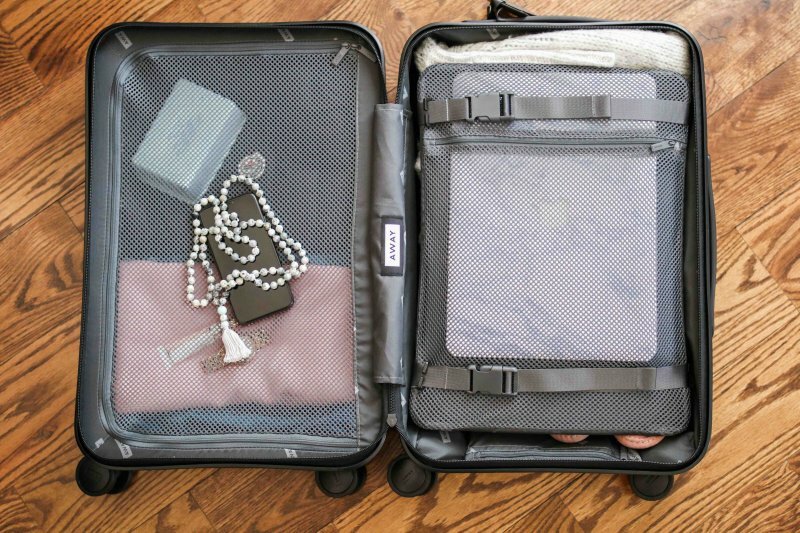 The lightweight design is easy to roll around an airport and the snug, tucked-in compartments on either side allow me to open the bag and access my laptop without all the contents flying out. As you can see in the photos above, this carryon holds a lot. 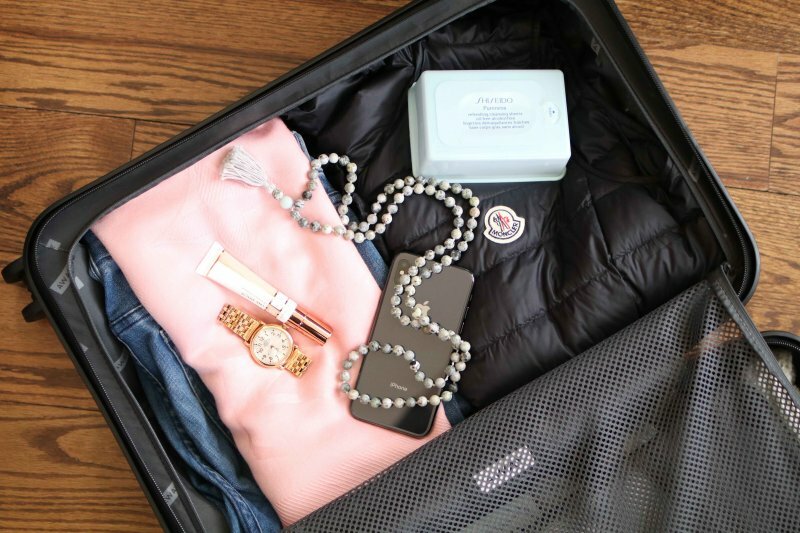 You can pack an extra change of clothes and shoes, essential toiletries, and in-flight entertainment with room to spare. I chose this beautiful denim blue color because it’s my husband’s favorite color and because it complements both black and brown when paired with other tote bags or duffels. For our checked bags, I went with the medium size in the hopes it would satisfy any European luggage size requirements and European rental cars. Since traveling with these bags to Aspen and to Seattle I’ve been pleasantly surprised with this lightweight bag’s packing capacity; it keeps clothes and toiletries securely organized in both sides of the bag while somehow offering space for anything we might pick up along the way. And like the carry-on, the design of the medium-sized luggage allows me to unzip my bag without the contents spilling everywhere. We are currently booking more adventures for this year and we can’t wait to take these along. 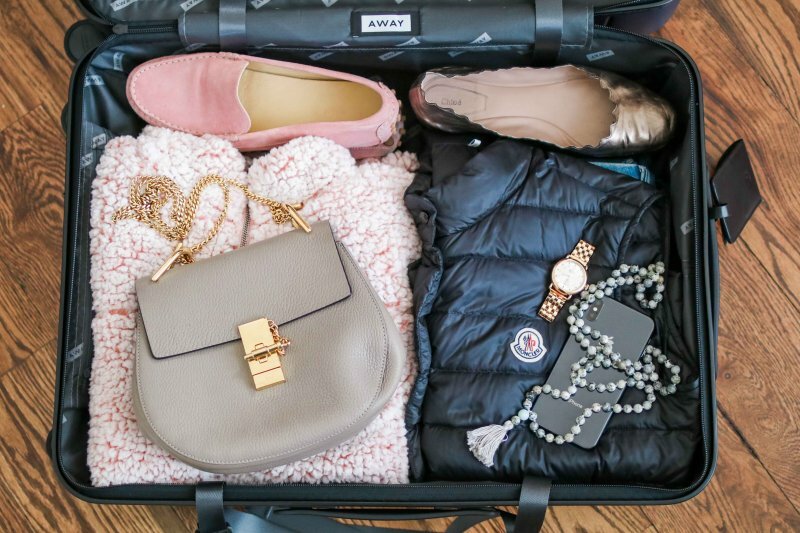 Another great option to add onto these bags is Away’s monogram-able Tile luggage tag; a tiny location-enabled device hidden in the luggage tag that is active for one year and allows you to locate luggage from your phone anywhere in the world. No matter what the airline says, you’ll know exactly where your bags are located. Take a peek at Away’s new aluminum collection. These durable bags are less expensive than many other brands on the market and their sleek design is gorgeous. I’m particularly fond of the aluminum carry-on for protecting my camera and laptop. 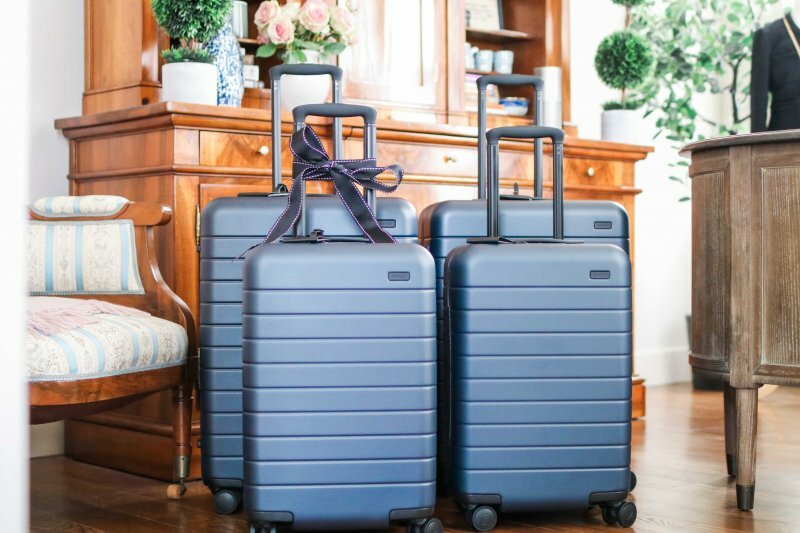 If you’re going to invest in two pieces of luggage or more, be sure to bundle them on Away’s website for a discount. 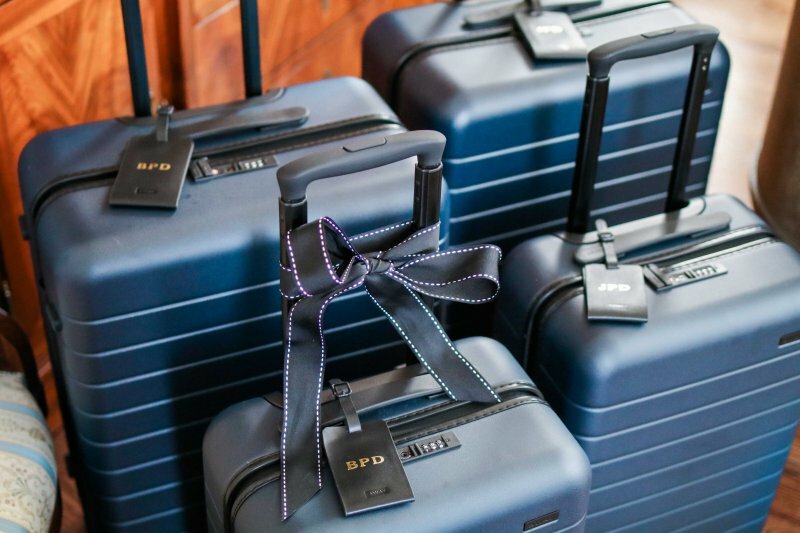 They offer discounts on a set of two suitcases and on a carry-on and personal bag combo.